The relatively mild winter of 2016-17 will mean our region will have more deer ticks spreading Lyme disease early this spring and throughout the summer and fall months. Sampling by the Tompkins County Health Department has shown about 20 percent of local deer ticks are infected with Lyme disease, a rate similar to areas of New York with high levels of Lyme infections. Cases of Lyme disease in county residents have grown steadily from seven in 2007 to 103 in 2014, the most current year available in a statewide study. While Lyme disease is a rising local concern, other infectious diseases such as Zika virus have raised national alerts and should be heeded by local residents traveling to areas where the diseases are found. Mosquito-borne transmission of Zika occurs in parts of South America, the Caribbean, southern Florida and Texas. Travelers to those areas can become infected with Zika by mosquito bites. The disease can also be spread sexually. Zika infections have been reported in every state in the U.S. One Zika infection has been reported in Tompkins County, and it appears to have resulted from travel to an area where mosquitos transmit the disease. Local residents traveling to areas were tropical diseases are prevalent, can now get vaccinations for many types of infections at the Cayuga Center for Infectious Diseases., 1301 Trumansburg Road. Call (607) 257-2920 for appointments. 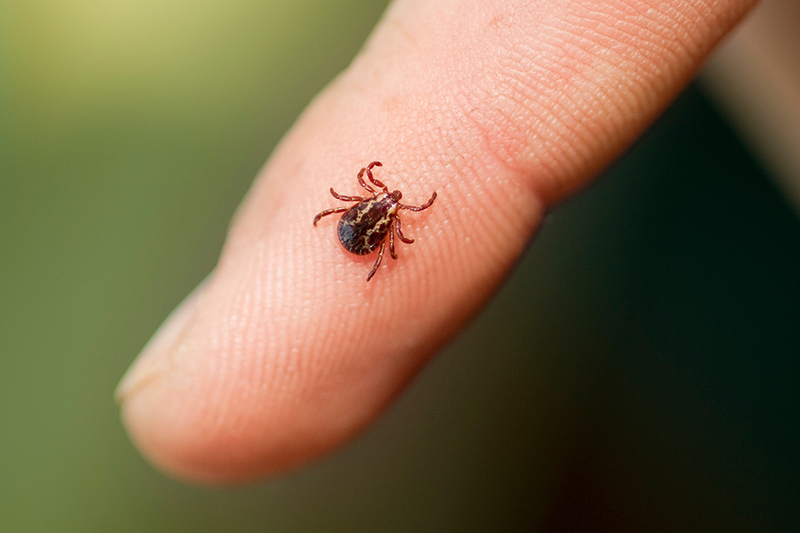 For the upcoming tick season, here are some ways to reduce your risk of getting Lyme disease. What steps can I take to avoid tick bites? Ticks are active any time the temperature is above 40 degrees and there is not dense snow cover. After you have been hiking in brushy areas or in the woods, check yourself and family for ticks. Look in all the nooks and crannies, including your armpits and in your hair. Be sure to check your young children because they may not notice a tick. Adult deer ticks are hard to find; nymphal deer ticks are even smaller and look like freckles with legs. Infected deer ticks live in shady moist areas and can be found throughout New York State. Adult deer ticks are the size of sesame seeds and are most active from March to mid-May and from mid-August to November. Young deer ticks, called nymphs, are active from mid-May to mid-August and are about the size of poppy seeds. Both nymphs and adults can transmit Lyme disease. During tick season wear long pants and long sleeves when you are outside. Use products that contain permethrin on clothing. Bug spray with DEET is also an effective tick deterrent. What do I do if I find a tick on my body? Use tweezers to grasp the tick at its head where it is embedded in the skin, pull with gentle, steady pressure then flush it down the toilet. Clean that spot with soap and water. If the tick is not full of blood when you remove it, this means it has not had enough time to transmit Lyme disease to you: in order to pass on Lyme disease, the tick must be attached to you for about 48 hours. Most tick bites in our region will not give you Lyme if you are bitten. What should I do after getting a tick bite? Record the date and location of the tick bite so it can be monitored for Lyme disease symptoms. If you have redness and itching soon after you remove the tick, it is an allergic reaction to the tick saliva. If you develop a round red rash that expands seven to 14 days after being bitten, it could be a Lyme disease rash and you should see your doctor. Should I see my doctor right after a tick bite for preventive antibiotics? Most deer tick bites will not transmit Lyme. If the tick is fully engorged you have two options. One is to monitor the area of the bite to see if the round rash develops. The other is to take a one-time dose of antibiotic, which may decrease the chance of getting Lyme disease. Antibiotics commonly used for oral treatment include doxycycline, amoxicillin or cefuroxime. My recommendation is to limit antibiotic exposure and monitor for symptoms. Testing for Lyme is not helpful just after a tick bite. Any blood test for Lyme disease will be negative because you have not had time to develop antibodies that indicate the infection is present. In addition to the round red rash, some people experience fever, aches, sweats, and low energy. Lyme tests are also negative at this point and should be avoided; antibiotics should be prescribed, based on the appearance of the rash. If the illness remains untreated for a few weeks, it may cause multiple red rashes and fever. At this stage, a blood test will be positive for Lyme, though the appearance of the rash is classic enough to make the diagnosis and start antibiotics. Untreated Lyme can eventually cause infections in the heart tissue, spinal fluid, and joints. However, even at these later stages, Lyme is completely curable with antibiotics. If untreated, do I run the risk of developing chronic Lyme disease? Chronic, incurable Lyme infection is not an entity. Some people may have prolonged fatigue or aches after Lyme infection, but this is not due to ongoing infection and does not respond to antibiotics. As with any serious infection, it can take time to recover from Lyme disease. Unfortunately, the notion of Lyme as an incurable infection has gained traction. This is because doctors claiming to be Lyme experts label patients with prolonged non-Lyme symptoms as having chronic Lyme disease. They give them long courses of antibiotics, even though randomized control trials show they do not help. In truth, these patients have been misdiagnosed with Lyme in the first place. Lyme disease is curable at any stage and is not permanent. Dr. MacQueen is board certified in internal medicine and infectious diseases. He is on the medical staff of Cayuga Medical Center and can be reached at the Cayuga Center for Infectious Diseases at (607) 257-2920.